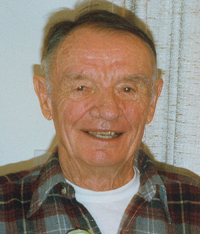 Nolan Daniel passed away on April 6, 2007, at his home in Bellevue, Idaho, with his wife of 69 years and his daughter and her close friend at his side. He was born in St. Anthony, Idaho, on Nov. 4, 1917 to Homer and Mary (Corey) Daniel. On April 1, 1938, he married Dorothy Hobbs. They have lived in Hailey and Bellevue with their daughter for the last 29 years, spending the winters in Washington, Utah. Nolan owned Daniel Drywall Construction for 30 years in Idaho Falls, he also worked in the shipyards during World War II and worked for General Mills. He was a lifetime member of the Elks Club. Nolan is survived by his wife Dorothy, his daughter and son-in-law, Pam and Chris Matey of Bellevue; his two sons and their wives Garry and Jackie Daniel and Dayle and Karen Daniel of Idaho Falls. He has 10 grandchildren, 14 great-grandchildren and one great-great-grandchild. He also has three brothers, three brothers-in-law, one sister and four sisters-in-law all over the age of 80. The family would like to thank all of the compassionate people supporting them in this transitioning. In lieu of flowers, please make donations in the memory of Nolan Daniel to the wonderful Hospice of the Wood River Valley, Box 4320, Ketchum, ID 83340. Arrangements are under the care of Wood River Chapel of Hailey.